This has been yet another extraordinary spring for Iowa. After a record drought in 2012, spring 2013 is the wettest ever in 141 years of state records. According to National Weather Service estimates over the last sixty days, some portions of eastern Iowa have received between 200 and 300% of normal rainfall. As a result, river levels around the state are on the rise, especially in eastern Iowa, where fears of a repeat of the record 2008 floods continue to loom. 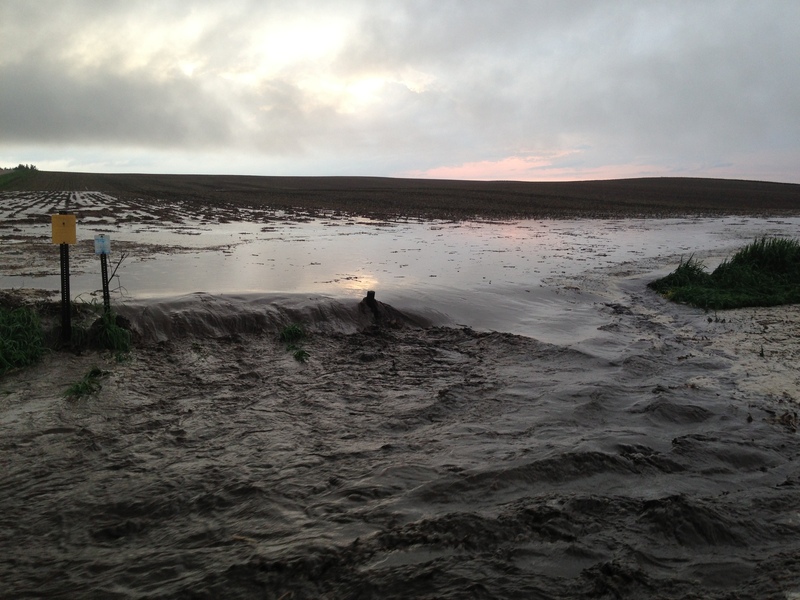 Heavy rainfall has placed Iowa’s natural resources under considerable strain. Removal of needed soil conservation efforts, like buffer strips, as well as the conversion of pasture and grassland to cropland, has accelerated the impact of recent rains. As was the case during last year’s drought, when Iowans encountered prolific algae blooms across the state, extreme weather conditions made Iowa’s lack of conservation preparedness especially clear. Climate change appears likely to increase the number of major rain events occurring in our state over time. It is not possible for Iowans to control the amount of rainfall we receive; therefore, it is essential to use good conservation practices and other measures to limit the harmful effects of heavy rain. Many of these practices also maintain clean water for drinking, recreation and swimming in times of fair weather. In the last two months, parts of east central and northwest Iowa have suffered soil erosion at rates several times greater than so-called “tolerable” soil losses of 5 tons per acre in a whole year. As the map below from the Iowa Daily Erosion Project shows, some townships in Iowa suffered as much as 24 tons of erosion in the last two months alone–nearly 5 times the rate considered “tolerable” in a year. Nitrogen and phosphorous pollution is always a serious problem in Iowa, even without heavy rains. According to the EPA’s 2008-2009 National Rivers and Streams Assessment, in the region including most of Iowa and Illinois, 72% of rivers and streams are rated “fair” or “poor” for total nitrogen. This year, however, nitrogen pollution has been of particular concern. Earlier in May, levels in the Raccoon and Des Moines Rivers reached record levels, prompting the Des Moines Water Works to temporarily stop using water from the rivers to serve its customers for fear of violating the federal safe drinking water standard. Water Works data shows nitrogen and phosphorous levels in the Des Moines and Raccoon have been creeping upward for 30 years. The City of Cedar Rapids also expressed concern over drinking water when it detected high nitrate levels in the Cedar River. These losses also represent a major financial loss for Iowa’s farmers who apply nitrogen as a fertilizer. A recent analysis of initial real-time nitrogen monitoring data between April 1 and June 2 shows the commercial value of nitrate flowing past 9 monitoring sites has been nearly $93 million–so far. According to the Department of Natural Resources, 186 million pounds of nitrate from nitrogen fertilizer, manure, and other sources has been lost downstream during the last two months alone. The amount of nitrate being lost continues to climb. Recently, state agencies released a final version of Iowa’s Nutrient Reduction Strategy which relies on extensive research by Iowa State University to suggest ways in which Iowa could significantly reduce nitrogen and phosphorous pollution, including from agricultural ground. Unfortunately, the plan to implement that research relies on the same all-voluntary approach to conservation that has not prepared Iowa for the soil erosion and runoff challenges we face today. As a result, drinking water, the health of aquatic life, and Iowa’s agricultural soils remain at risk. In order to resolve these problems, Iowa must successfully utilize additional conservation practices all across the landscape to hold heavy rains where they fall, prevent soil erosion, and keep polluted runoff from reaching rivers and lakes. The Iowa Environmental Council supports the conservation action necessary to meet this challenge, and many of our member and cooperator organizations work actively in the area as well. However, recent evidence suggests Iowa has a long way to go before we can endure heavy rains without major human and environmental consequences. We need your support to help Iowa build healthier natural systems and be better prepared for the storms (or droughts) that lie ahead. 1. The strategy’s approach for addressing agricultural sources of nitrogen and phosphorous pollution (also referred to as non-point source pollution) will fall short of creating significant, sustainable, statewide improvements in Iowa’s waters. The strategy’s approach to engaging farmers is neither substantially different nor better from what is already happening in Iowa. State officials have proposed replacing Iowa’s current all-voluntary conservation efforts with new “aggressive” all-voluntary conservation efforts. The strategy does not clearly define how farmers who contribute to Iowa’s nitrogen and phosphorous pollution problem will be held accountable for helping to solve it. It proposes a range of improvements to current conservation programs, but they are vague and lack timetables and clear goals. The strategy’s authors emphasize benefits of all-voluntary conservation programs without providing evidence of why these methods, which have fallen short of protecting our waters in the past, will be successful now. The strategy argues that significant improvements to voluntary conservation programs can be made without any initial increases in state funding—despite noting that existing funds for landowners to implement conservation practices “are often limited and oversubscribed” (p. 19). [i] The lack of a plan for obtaining additional funding for voluntary conservation efforts with initial costs as high as $1.2 billion to $4 billion (p. 4) raises still more doubts about whether the plan can succeed on a comprehensive, statewide basis. 2. The strategy does not set specific goals for lower nitrogen and phosphorous pollution levels in local lakes and rivers. These goals are necessary to ensure the strategy solves water pollution problems facing rivers and lakes in Iowa as well as downstream. The authors of the strategy make clear that Iowa’s nutrient strategy was written to reduce Iowa’s contributions of nitrogen and phosphorous pollution to the Gulf of Mexico by 45%. However, the strategy fails to list either short-term or long-term goals for water quality improvements for Iowa’s rivers and lakes. The Environmental Protection Agency’s framework for state nutrient strategies (the “Stoner memo”) calls on states to set numeric goals to limit nitrogen and phosphorous pollution in waterways. To motivate Iowans to invest in substantial and sustainable improvements in water quality, Iowa needs these goals, which are based on benefits to Iowa waters. The nutrient strategy evades this responsibility, promising only to “[evaluate] the need for nutrient water quality standards” in the future. Further, while the strategy describes the challenges of establishing these numeric goals at great length, it does not mention that in 2011, Iowa nearly finished a process to set numeric criteria for recreational lakes which was tabled pending completion of additional research. Despite the considerable progress Iowa had made when work stopped, the nutrient strategy does not call for resuming this effort now or in the future. 3. The strategy contains useful research about what it will take to clean up Iowa’s waters. As part of the nutrient strategy, an Iowa State University-led team of researchers examined how successful different practices on agricultural land are at reducing nitrogen and phosphorous pollution. Almost all of their work is on practices already in existence and to some extent followed by a portion of Iowa farmers. Their findings provide important insight on the benefits of greater use of these practices and about how Iowa can focus its limited resources to achieve the best results. Having this information centralized in one place gives Iowa a good “road map” to make significant progress on nitrogen and phosphorous pollution now. In addition, continuing research by the team will help make Iowa’s pollution control efforts even more effective over time. 4. The strategy proposes new mandatory standards for how cities treat their wastewater to reduce pollution levels. However, these improvements will likely not solve Iowa’s larger pollution problem unless they are accompanied by more effective participation by agriculture. The strategy lays out a plan for reducing the amount of nitrogen and phosphorous released by large municipal and industrial wastewater treatment facilities where it is determined that the additional treatment is technically feasible and affordable. This new treatment to remove nitrogen and phosphorous would be required, not voluntary, under the Clean Water Act permits that these facilities must currently obtain. The proposed changes in the strategy could reduce point source nitrogen releases by many wastewater facilities by two thirds and phosphorous releases by three quarters. At the same time, the strategy recognizes that point source pollution is a much smaller contributor to Iowa’s overall problem than non-point source pollution (Table 1). Source: Iowa Nutrient Reduction Strategy, p. 7. Even if cities add nitrogen and phosphorous treatment to their wastewater plants and raise their customers’ rates to pay for it, the vast majority of the problem will remain unsolved without effective programs and real results on the non-point source/agricultural side. 5. The Iowa Environmental Council is working hard to ensure the voices of Iowans like you who value clean water are heard in this debate. Most Iowans have not had an adequate opportunity to comment on this strategy, and it appears input has been artificially limited to a select few interest groups. The Council believes that this plan can only be stronger when all Iowans have the opportunity to contribute to it. The Iowa Department of Agriculture and Land Stewardship and its partners released the new nutrient strategy with only a short 45 day public comment period. The Council is preparing comments on additional elements the strategy should include to secure the results for clean water Iowans expect. In addition, over the next few days, the Council will provide additional guidance to members of the public who wish to submit comments on the strategy via our action alert system. [i] According to a Department of Agriculture press release, on December 6, Secretary of Agriculture Northey announced his request that Governor Branstad include $2.4 million in additional funding for agricultural conservation in FY-2014 and $4.4 million in additional funding in FY-2015. The nutrient strategy (p. 12) identified $15.1 million in state funding for conservation programs the legislature approved for the current fiscal year (FY2013). Even with the increased funding, the nutrient strategy suggests much more would be needed to achieve its target result of a 45% reduction in pollution reaching the Gulf of Mexico. According to the strategy, “annual costs” of implementing the strategy “including initial investment and operating cost, range from $77 million per year to $1.2 billion per year” (p. 4). Submitted by Linda Kinman, past president of the Iowa Environmental Council’s board of directors, Public Policy Analyst at Des Moines Water Works and executive director of public policy for the Iowa Association of Water Agencies; both are Council member organizations. During the 1800s, scientists began to gain a greater understanding of the sources and effects of drinking water contamination. Federal regulation of water quality did not begin until 1914, when the US Public Health Service set standards for bacteriological standards. It wasn’t until the late 1960s that the Public Health Service determined that in addition to pathogens and chemicals, industry, agriculture and the creation of man-made chemicals also had negative impacts on the environment and public health. Further studies increased awareness and eventually led to passage of the 1974 Safe Drinking Water Act (SDWA). Today, drinking water is one of the most regulated industries in the country because clean drinking water is critical to our ultimate objective of protecting public health. The United States is the one place in the world where you can go to any tap, drink the water and know that it is safe. Would that be the case without regulation? Can further protection of drinking water sources happen without additional regulation? Regulations are in place to reduce environmental pollution and are the foundation for protecting public health. Without compliance, regulations do not achieve the desired results. Achieving compliance involves an effort that compels changes in behavior. Some individuals comply with regulations voluntarily, some will not, and some will comply only if they see that others are being penalized for noncompliance. Enforcement of regulations deters violators from violating. When voluntary actions fail, an effective regulatory program ensures individual adherence to standards, which benefit the majority. Regulatory programs provide an understanding of expectations by all affected parties. To provide this understanding, enforcement of state and federal regulations must be fair, consistent, timely and expected. Perception is important in creating deterrence, and how enforcement actions are taken is just as important as the fact that they are taken. Special leniency considerations should be minimal, and cases spanning multiple years–especially with ongoing or multiple violations–should not result in preferential or lenient decisions. Compliance reinforces the credibility of the enforcement efforts and the legal systems that support them. The effectiveness of Iowa’s environmental enforcement efforts rely on the actions of the Iowa Department of Natural Resources and the Environmental Protection Commission. Their willingness and ability to enforce rules and regulations put in place by the U.S. Congress and Iowa State Legislature affirmatively promotes voluntary compliance and identifies and imposes legal consequences on the minority who choose not to comply. Effective enforcement brings many benefits to society, and the most important is the protection of public health. Regulations identify Iowans’ moral principles – their social values and quality of life expectations. Effective enforcement ensures fairness for those who willingly comply with rules and regulations.